Last month we performed our dreamy, mobile-inspired four-hand arrangement of Brahms' Lullaby on Performance Today. Watch our performance here, starting at 17:53. To mark the occasion, we've released score to the public. To celebrate the holiday season, we've released our arrangement of "Ave Maria" (arranged for piano—four hands). And we found two Beethoven symphony scores (both arranged for two pianos) to make available in celebration of Beethoven's 247th birthday! During our visit to beautiful, snowy Santa Fe this past Christmas Eve, we were excited to premiere a work that has been years in the making: Brahms' Double Concerto in our arrangement for two pianos and orchestra. We were fortunate to perform the work with the Performance Santa Fe Symphony under the direction of maestro Joseph Illick, whose boundless positivity and supreme flexibility made the premiere a joyous success. Brahms often struggled with instrumentation when composing. For example, he morphed his string quintet into a two piano sonata before finally settling on its final form: a piano quintet. Similarly, the first piano concerto began as a sonata for piano, four hands. But regardless of his music's instrumentation, one gets the sense that he conceived at the piano, especially given how many of his works he ultimately arranged for piano duo and duet. In fact, Brahms arranged nearly every piece he wrote for the genre — see Christian Köhn and Silke-Thora Matthies’s complete 18-disc set of Brahms' piano duo music for evidence. With the Double Concerto, the solo violin and cello lines translated themselves idiomatically to the piano. We were further delighted by the number of similarities between this concerto and his two solo piano concertos, which we ultimately highlighted in the arrangement itself. The pieces feels as if we're performing a big, Romantic Brahms piano concerto, but with the added dialogue of a double concerto. And suitably, the piece's biographical subtext remains firmly in place (the piece was composed as something of a reconciliation plea to violinist Joseph Joachim); the piece now serves as a universal statement of pain, forgiveness, and friendship. How do you mute the piano strings in your arrangement of Vivaldi's "Sento in Seno." Good question! The score (which you can purchase here!) simply states: "All strings played by piano 2 (A-flat below middle C and higher) should be muted by a system of felts and weights." Not very helpful, right? But that's the fun of it! We love the "arts & crafts" aspect of our duo, whether it be making videos or muting piano strings, and we hope to foster this spirit of exploration when people purchase our scores. For example, in our four-hand scores, you'll note that we don't provide any choreography instructions. Figuring it out is half the fun! Besides, in the case of pianistic choreography, body types are different, and what works for us won't necessarily work for you. Similarly, in the case of muting piano strings, the insides of pianos are very different, and there is no way we could provide instructions to mute all the varying piano models. 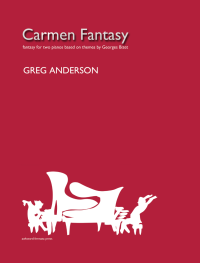 For all of our piano-playing fans, we've got another challenge waiting for you: our "Carmen Fantasy for Two Pianos." 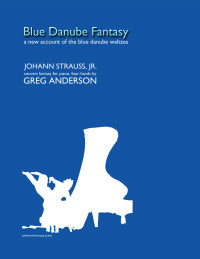 You can purchase (and instantly download) a PDF file of the score on the scores page. The sheet music will be available for sale on amazon.com in the coming weeks. The piece has been a hit at our concerts... stay tuned, we'll reveal our music video of the piece shortly!